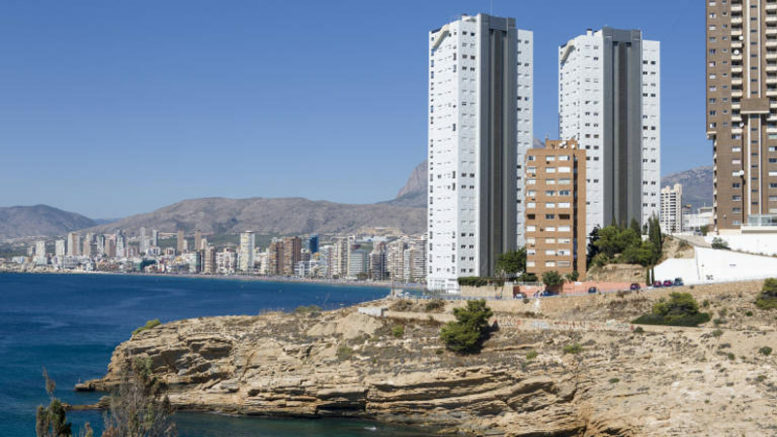 Landmark twin residential towers that encroach upon the public right of way at Punta Llisera on the Bay of Benidorm in Alicante province are facing a demolition order after Spain’s Supreme court upheld a 2012 ruling to that effect by the Valencia regional high court. The Gemelos 28 towers, which house 168 luxury apartments and rise 22 stories on the Benidorm skyline, were built during Spain’s construction boom in 2005 and were authorized by the Valencian Conselleria de Infraestructuras (Ministry of Infrastructure) under the former Partido Popular (PP) regional government. The minister in charge of the regional Conselleria at the time was Isabel Bonig, currently the opposition spokesperson for the PP in Valencia. The 2012 Valencia high court ruling ordering the tower’s demolition said that the Valencian regional government had authorized the illegal encroachment by several meters onto the protected public right-of-way area in violation of Spain’s national coastal protection legislation. The Valencian government was ordered by the regional court to demolish the towers and to reimburse the owners of the apartments, which were valued at 400-700,000 euros each when first sold. Though the Supreme Court effectively sustained the lower court order for the demolition, property owners are hoping to negotiate a compromise that would allow them to move the coastal boundary of the property so as not to encroach on the protected right of way. Failing that, they say they may appeal to the European Court of Justice to halt the demolition. In 2016, Spain’s Supreme Court similarly ordered demolition of the El Algarrobico hotel on the beach at Carboneras, Almería, because it was built in violation of zoning regulations on public land. Although the governments of Andalucía and Spain have agreed to share the cost of the demolition, the El Algarrobico is still standing, prompting Greenpeace España to petition the Andalucía regional high court last month to order the government to commence the tear-down.